Now that my marathon goal race is over, I've been thinking about what I want to do next. This past year has been a struggle from a training standpoint due to a hip flexor injury, and I did hardly any speedwork or trail running. Both of those things are what helped me to be stronger and faster before, so losing them made a huge difference in my times. My best half marathon time this year was 2:04, a far cry from my 1:57 PR set in October 2013. Celebrating my first and only sub-2 half to date. RnR St. Louis in 2013. What does all of that mean? My next goal is to run a faster half marathon! I want another sub-2 hour half, and I want a PR. I feel like I can get back there. As of now, I have three half marathons coming up in early 2015. The Surf City Half in February will be a good tune up but I don't expect to be ready to PR. The Oakland Half in late March could work out depending on how training goes. When it's time for the SLO Half in late April, I hope to go for it. I was considering the full marathon in SLO, and as an ambassador I thought it would be great to target the big event. But when it came down to it, I considered what I really want out of my next races and another marathon just isn't it. Training for a marathon needs extra weekly mileage and long runs that never seem to help me with getting faster. 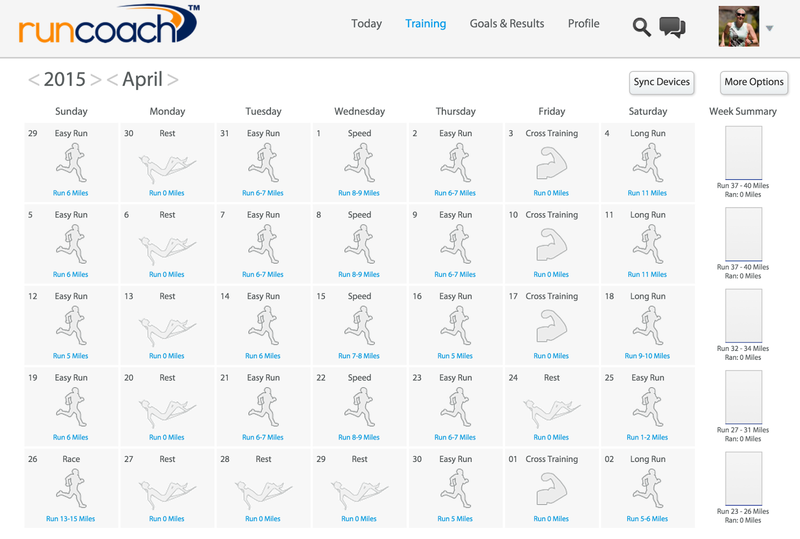 I'm managing my training plan for the SLO Half via RunCoach.com, which I've been using for many months now. I was skeptical at first, but I've really come to enjoy my workouts being outlined by someone else. It makes it easy to figure out a schedule and I have it set to email me the workout each morning. What April looks like right now. I'm also interested in a book I read about on Nicole's blog, which I purchased and will be reading soon. The book is called 'Run Faster (From the 5K to the Marathon - How to Be Your Own Best Coach)' and talks about how training by specific pace is important. I admit I'm not someone who usually trains by pace; aside from speed workouts, I run whatever I feel like that day. I'll be giving training updates on my SLO Half progress here so you can all hold me accountable for working hard and training at pace. Let's do this! P.S. If you sign up for the SLO Marathon or Half, use my discount code FERAMB for $10 off! Wow, we are a lot alike in our goals! Why does it matter SO much to us if come in under or over 2 hours! I am elated if I'm under and totally pissed off at myself if over. Something about that number! I am going to take a look at your plan above. Thanks for sharing! I know - it's so silly right? But it still matters?! I am liking RunCoach a lot, I should have mentioned that it's a pay-for-play service but I think it's very reasonable. I trained very much by pace this summer for a half, and I went from a 2:03 half at ZOOMA Napa to 1:55 in September. I think I had some untapped speed but the challenging plan and specific work helped so much. Best wishes! I agree, running at goal pace is so important (as long as you do it the right way). I really hope 2015 brings you a nice PR. I'm going to check out the SLO half. I'm looking for a few new race vacations for next year! I love your blog a lot. Good luck on all your training! It sounds like we have similar goals for SLO and Surf City. I would really love to PR at SLO, mine was set in October 2013. I am hoping to get everything squared away health wise and get back to speed training after Surf City. Good luck with training! Wow, we really are similar - my PR was set in Oct 2013 too. Haha. I hope you have good luck with health and training!